Russian historian, Talmudist, and cabalist; died, according to Zunz ("Kalender," 5623, p. 18), at Ungarisch-Brod, Moravia, July 14, 1663. Jacob Aboab, however, in a letter to Unger (Wolf, Bibl. Hebr." iii., No. 1728), gives Pieve di Sacco, Italy, as the place of Hannover's death, without indicating the date. The place of his birth is equally uncertain. 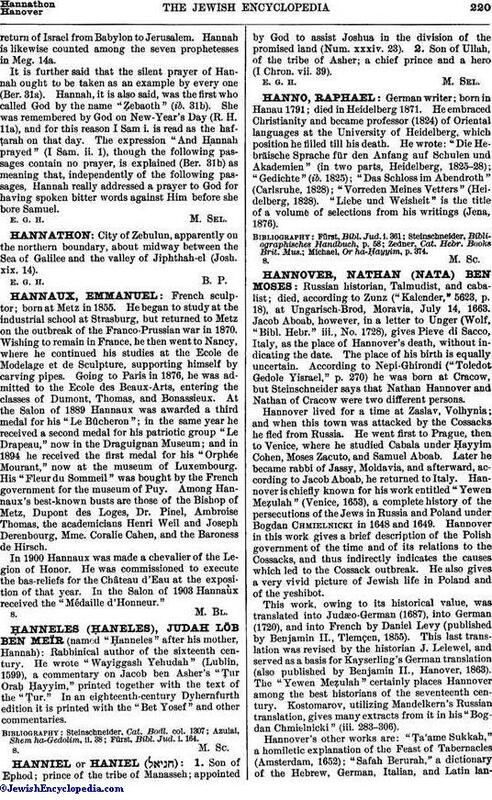 According to Nepi-Ghirondi ("Toledot Gedole Yisrael," p. 270) he was born at Cracow, but Steinschneider says that Nathan Hannover and Nathan of Cracow were two different persons. Hannover lived for a time at Zaslav, Volhynia; and when this town was attacked by the Cossacks he fled from Russia. He went first to Prague, then to Venice, where he studied Cabala under Ḥayyim Cohen, Moses Zacuto, and Samuel Aboab. Later he became rabbi of Jassy, Moldavia, and afterward, according to Jacob Aboab, he returned to Italy. Hannover is chiefly known for his work entitled "Yewen Meẓulah" (Venice, 1653), a complete history of the persecutions of the Jews in Russia and Poland under Bogdan Chmielnicki in 1648 and 1649. Hannover in this work gives a brief description of the Polish government of the time and of its relations to the Cossacks, and thus indirectly indicates the causes which led to the Cossack outbreak. He also gives a very vivid picture of Jewish life in Poland and of the yeshibot. This work, owing to its historical value, was translated into Judæo-German (1687), into German (1720), and into French by Daniel Levy (published by Benjamin II., Tlemçen, 1855). This last translation was revised by the historian J. Lelewel, and served as a basis for Kayserling's German translation (also published by Benjamin II., Hanover, 1863). The "Yewen Meẓulah" certainly places Hannover among the best historians of the seventeenth century. Kostomarov, utilizing Mandelkern's Russian translation, gives many extracts from it in his "Bogdan Chmielnicki" (iii. 283-306). 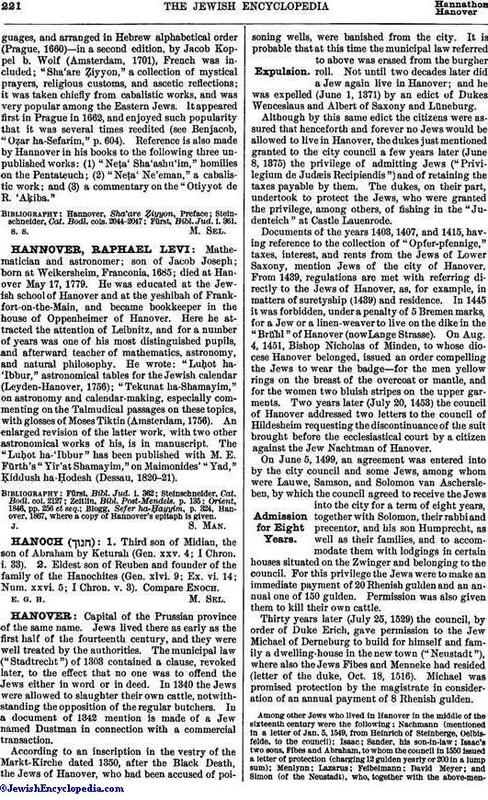 Hannover's other works are: "Ṭa'ame Sukkah," a homiletic explanation of the Feast of Tabernacles (Amsterdam, 1652); "Safah Berurah," a dictionary of the Hebrew, German, Italian, and Latin languages,and arranged in Hebrew alphabetical order (Prague, 1660)—in a second edition, by Jacob Koppel b. Wolf (Amsterdam, 1701), French was included; "Sha'are Ẓiyyon," a collection of mystical prayers, religious customs, and ascetic reflections; it was taken chiefly from cabalistic works, and was very popular among the Eastern Jews. It appeared first in Prague in 1662, and enjoyed such popularity that it was several times reedited (see Benjacob, "Oẓar ha-Sefarim," p. 604). Reference is also made by Hannover in his books to the following three unpublished works: (1) "Neṭa' Sha'ashu'im," homilies on the Pentateuch; (2) "Neṭa' Ne'eman," a cabalistic work; and (3) a commentary on the "Otiyyot de R. 'Aḳiba." Fürst, Bibl. Jud. i. 361.